Lavender recently came back to SaveABunny after her human, SaveABunny volunteer Robyn Price, passed away very suddenly. Every once in a while I meet a rabbit who is just really funny. When I say "funny", I don't necessarily mean "ha ha" comical funny, but rather that he or she just makes me laugh. Here she is climbing over the sofa. Lavender is a REALLY smart rabbit. She's opinionated, bossy, demanding and also very loving once she gets to know and respect you. I can totally relate to that! She also is a big flirt with my husband Rob. 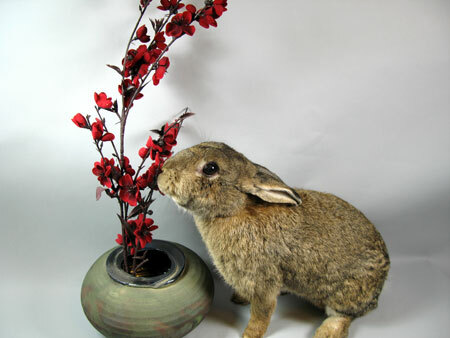 Lavender's a very interactive rabbit who communicates and engages directly with you. She looks you in the eye and demands that you listen and take her seriously. She is sort of funny looking with her skinny little legs,round body and big dewlap. She has the very early stages of cataracts in both eyes. Clearly, she is middle-aged, yet she is full of life and definitely has big plans and a full agenda. When I first met Lavender at the shelter she was named Zahra, and she had a huge pink sign on her cage listing her as a vicious animal. I made a video about her, but we didn't have room at the time to take her. Since she had been tagged as unadoptable she would have been euthanized without rescue. I couldn't stop thinking about her. It saddened me how unfair it was that her life would end because she was misunderstood. She was NOT vicious. She was simply a really smart rabbit who was hurt and frustrated about being abandoned at a shelter. Fortunately we adopted out another rabbit, which made room for Lavender to come to SaveABunny. She is now doing great and is enjoying being treated like the diva that she is. She's had some dental issues requiring tooth extractions, so she will need to take antibiotics for several months and be monitored for any signs of infection. Lavender is currently living with Dolly and Firenza and it would be wonderful if she was adopted along with one of her friends. Though she still has "rabbitude," she's so much happier now that she's with her loving friends. If you like a rabbit with a big personality who is eager to bond with you and be your princess, then Lavender is your bunny girl.